“Resist, Resist, Resist”: Thousands Protest Trump in Solidarity with LGBT Community at Stonewall in NYC | Democracy Now! On Saturday, thousands of anti-Trump demonstrators supporting the LGBT community held a rally in front of the Stonewall Inn in New York City’s West Village. The site was recently designated by the Obama administration as a national monument for its historic role in the long fight for gay rights. On June 28, 1969, police raided the Stonewall Inn. The people inside, led by transgender patrons, fought back. The ensuing riot launched the modern gay and lesbian rights movement. New York City elected officials, activists and celebrities spoke at Saturday’s event. We hear voices from the rally, including the first openly gay New York City Council member, Corey Johnson, as well as actress and model Hari Nef, actor Omar Sharif Jr. and transgender Mexican activist Ishalaa Ortega. JUAN GONZÁLEZ: On Saturday, thousands of anti-Trump demonstrators supporting the LGBT community held a rally in front of the Stonewall bar in New York City’s West Village. The site was recently designated by the Obama administration as a national monument for its historic role in the long fight for gay rights. 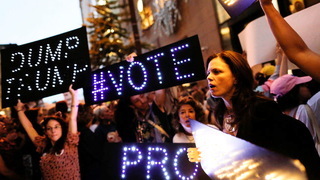 New York City elected officials, activists and celebrities spoke at the event. On June 28th, 1969, police raided the Stonewall bar. The people inside, led by transgender patrons, fought back. The riot that ensued launched the modern gay and lesbian rights movement. The uprising began in the morning on June 28th, 1969, when New York City police officers raided a gay bar called the Stonewall Inn in Greenwich Village. We hear first from the first openly gay city councilmember of New York, who is also HIV-positive. COUNCILMEMBER COREY JOHNSON: We have the ability to push back. We will protest. We will march. We will engage in civil disobedience. We will let our voices be heard! My name is Councilmember Corey Johnson, a member of the New York City Council. We’re here today for an LGBT solidarity rally to stand up to this demagogic, anticonstitutional administration. Stonewall is the modern birthplace of the gay rights movement. And we come here in times of celebration, and we come here in times of anger and in protest. And that’s because people bled here. People put their bodies on the line here. People stood up to oppression here. And that’s what we’re doing today. We are saying you are not going to oppress us. We know our self-worth. We know our self-value. And we’re going to push back. ISHALAA ORTEGA: My name is Ishalaa Ortega, and I am here fighting for our rights. As an immigrant transgender woman of color, as an atheist, as a person who had to run away from my own country, I am here to tell Donald Trump that we resist, and we’re not going to accept what he’s trying to do against us. ANNOUNCER: Please welcome to the stage Egyptian actor and activist Omar Sharif Jr.
OMAR SHARIF JR.: You know, when I came out, it was at a scene not unlike this. It was the height of the Arab Spring in Egypt, and I decided to use my voice to come out. It didn’t go so well. I faced threats of intimidation, of violence, even death threats, and I was forced to leave overnight. But I got here to New York. I was welcomed by New York. You guys for so long have been that beacon of liberty, of hope, of justice, of freedom for all. Don’t back down! Resist! Keep fighting! Fight for those like me. Fight for those without a voice. Resist! Resist! Resist! HARI NEF: New York is our home. America is our home. My name is Hari Nef, and I’m here because I am a Jewish-American trans woman, and I have no choice but to resist. Donald Trump stands to normalize hatred. He poses as an ally to our community, and yet his initiatives for religious freedom stand to devour so many things that my community has fought and worked for. And this will not happen, and this cannot happen. PROTESTERS: We will not be silent! We will not be silent! AMY GOODMAN: Some of the voices among thousands who came out outside the Stonewall Inn in New York’s West Village this weekend to protest Donald Trump and to remember what happened decades ago when the police raided this historic bar. Among those who led the charge against the police were trans activists.